Gathland State Park was once the mountain home of George Alfred Townsend, a Civil War journalist. In the late 1800's, Gathland featured a unique collection of buildings and structures designed and constructed by Townsend. Two of the structures, the Main Hall and Lodge, were partially restored in the 1950's. A large stone monument dedicated to the memory of Civil War correspondents is the outstanding attraction of this day-use park. The Appalachian National Scenic Trail traverses the park and passes the monument base. Certain activities are permitted outside of the regular park hours. Please check with the park before your visit if you plan to engage in an activity which requires you to be in the park before or after the posted hours. The War Correspondents Arch is a National historic monument. Constructed in 1896, the monument stands fifty feet high and forty feet broad. The monument is administered and maintained by the National Park Service. Gathland State Park is located in Crampton's Gap, which witnessed a portion of the Battle of South Mountain, the first major battle of the Civil War fought in Maryland. Two buildings from Townsend’s estate survive, and now serve as Gathland State Park's museum. The museum features many artifacts from Townsend’s life, career and estate, as well as artifacts from the Battle of South Mountain. The museum is open on the weekends during the spring, summer and fall, but the grounds are accessible year-round. The Appalachian National Scenic Trail passes through Gathland State Park. Visitors are welcome to hike the A.T. from Maine to Georgia or for just a few miles. Those planning an overnight backpack outing can park at Gathland State Park for a few days. The Appalachian Trail is a footpath only. Mountain bikers can use the trails at Greenbrier State Park. 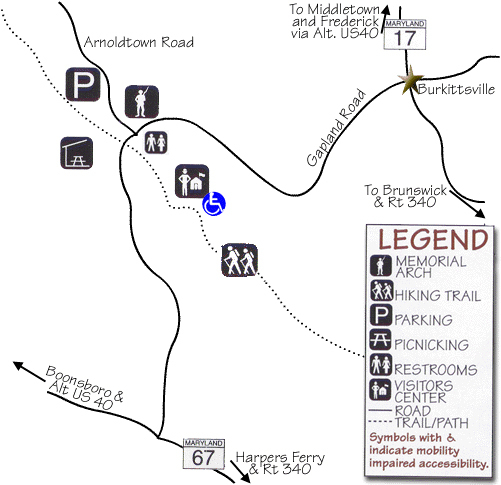 Overnight parking for the Appalachian Trail is permitted in the Arnoldstown Road parking lot. Please take any valuables with you. The Gathland Pavilion can accommodate up to 100 picnickers. Pets are allowed in Gathland State Park. Gathland State Park was once the mountain home of George Alfred Townsend, a Civil War journalist. In the late 1800's, Gathland featured a unique collection of buildings and structures designed and constructed by Townsend. Two of the structures, the Main Hall and Lodge, were partially restored in the 1950's. A large stone monument dedicated to the memory of Civil War correspondents is the outstanding attraction of this day-use park.